With the huge global hydro resource, renewable energy has always provided a significant portion of global electricity. Indeed, hydro alone provides about 16% of the world's electricity. Now with wind energy reaching 300,000 megawatts of capacity this year and solar taking off, renewable energy is growing rapidly around the world. Renewable energy already has 1,693,000 megawatts of installed capacity and will exceed 2,000,000 megawatts by 2016. By 2018, it will provide as much as one quarter of the world's electricity, and only coal will generate more, according to the International Energy Agency's 2013 Mid-Term Renewable Energy Market Report. "In some markets with good resources, the levelised cost of electricity (LCOE) for onshore wind is competitive or close to competitiveness versus new coal- and natural gas-fired power plants. In Brazil, onshore wind competes well with new gas-fired plants and other historically less expensive renewable sources, such as hydropower and bioenergy. In Australia, wind is competitive versus the generation costs of new coal- and gas-fired plants with carbon pricing, and the best wind sites can compete without carbon pricing. In Turkey and New Zealand, onshore wind has been competing well in the wholesale electricity market for several years. With long-term power purchase agreements (PPAs), onshore wind costs are approaching that of new coal-fired plants in South Africa. In Chile and Mexico, onshore wind competes – or is close to competing – with new gas-fired plants. In the United States, although onshore wind remains more expensive than new gas-fired generation, long-term PPAs for wind power can provide cost-effective hedges against rising fuel prices over the long term, even without federal tax incentives." Wind is a bit ahead of solar in reaching economic parity with coal and gas. Make no mistake, renewable energy's explosive global growth is rooted in its increasingly competitive economics. The International Energy Agency projects that renewable energy will provide globally two times as much electricity as nuclear power and more power than natural gas by 2016. Impressive! Pennsylvania's jobs record is now a disaster. The Commonwealth's job creation has fallen nearly to nothing--just 4,700 jobs over the last 12 months. And to make matters worse for the political and ideological apologists for Governor Corbett, jobs are being created in large numbers both in the national economy and the Big Blue states of New York, California, and Illinois. Nationally, the country has created about 2 million jobs in the last year, while Pennsylvania could not even reach the 5,000 jobs threshold. Moreover, California, Illinois, and New York--three states that the right wing loves to hate--created 12 to 53 times more jobs than Pennsylvania did. Those of us in Pennsylvania can read the Bureau of Labor Statistics data and weep. From May 2012 to May 2013, California created 252,100 jobs; New York 95,400 jobs; and Illinois 49,100 jobs. By comparison, to remind one more time, Pennsylvania came forth with a puny 4, 700 jobs, despite a gas boom. So what has and is going wrong in the Commonwealth? With Pennsylvania ranking 7th in job creation in 2010, Governor Corbett swept into office in January 2011 and busily went to work slashing budgets for education, refusing to raise taxes to pay for transportation, cutting taxes for favored businesses, and turning down $4 billion from the federal government that would go to our hospitals. For good measure, he refused to implement a real gas drilling tax and proudly reminded all that he had signed the jobs killing Grover Norquist Tax Pledge. Governor Corbett faithfully follows the budget and tax policies recommended by the Tea Party and austerity economics. The jobs results, however, are ugly and get worse the longer Tom Corbett and his policies govern. Criticizing Governor Corbett is easy work but not good enough. And so I have a Jobs Plan that would create 382,500 jobs. It's available at www.hangerforgovernor.com. America typically adds 15,000 to 20,000 megawatts of new generation every year or about 1,500 megawatts on average per month. Though America has added as much as 70,000 megawatts of new generation in a single year, any year in which more than 30,000 megawatts is added is unusual. During May, America added 3,488 megawatts of new generation capacity added across America, making it a blockbuster month. Gas-fired generation accounted for 72% or 2,529 megawatts of that massive total. From January to May in 2013, 4,097 megawatts of new gas-fired generation has been added. That represents about a 25% increase over the same period in 2012. The rest of May's new generation came mainly from a single coal plant coming on line. The plant is the only new coal plant to begin operations in 2013, but it is big, having a capacity of 925 megawatts. So will 2013 be one of those rare years when new electricity generation exceeds 30,000 megawatts? No. From January to May, a total of 7,102 megawatts of new generation was built, and the country is on course to install this year between 15,000 to 20,000 megawatts, the normal annual range. All the new generation that has begun operations in 2013 is either gas or renewable energy, with the exception of the single coal plant that started operating in May. The present and future of new power plants in America remain almost completely gas and renewable energy plants! That makes America totally different from China, India, and many parts of the world, where coal continues to gain ground. Oil remains the world's leading source of energy, providing 33.1% in 2012, but its share has fallen to its lowest level since at least 1965 and now could be displaced as the world's top energy source by coal. As oil loses market share, coal gains market share and provided 29.9% of the world's global energy in 2012, its highest market share since 1970. The two most carbon intensive fuels--oil and coal--are the world's biggest sources of energy and together supply 63% of the globe's energy. One need look no further than those facts to understand why the world continues to increase the concentration of carbon dioxide in the atmosphere and why many are pessimistic about the world's ability to avoid enormous warming in the next 80 years. Other than coal and oil, what does the world use for the rest of its energy? Natural gas provides 23.9%; hydro power 6.7%; nuclear power 4.5; and non-hydro renewable energy 2.4%. Those fuels are zero carbon or lower carbon than coal or oil. But in 2012, the world used more coal and oil than ever before, and coal moved toward displacing oil as the world's leading fuel. At least, in the luxury sedan market, Tesla and its electric technology are top sellers. 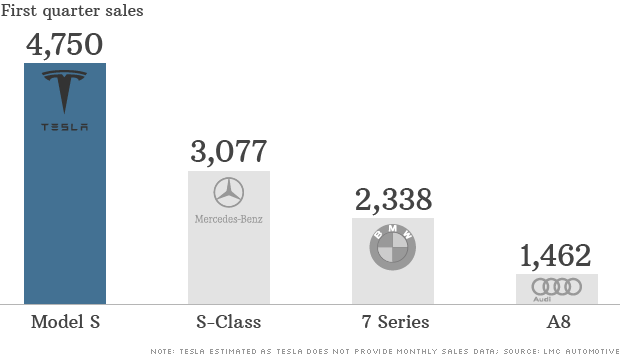 In fact, Tesla more than doubled the sales of the BMW 7 Series and beat by 50% the sales of the Mercedes S-Class. These are tough times for coal in the USA, but the USA is a global exception. Globally 2012 was coal's greatest year since 1970. Coal provided the world 29.9% of all its energy, its highest market since 1970. Here are more highlights from the BP 2013 Statistical Energy Review showing that happy days are here for coal around the world. While global energy consumption rose 1.8%, coal consumption rose more quickly at 2.5%. Global coal production also increased 2%. Among leading coal countries, coal consumption and production declined only in the USA, where consumption and production dropped 11.9% and 7.5% respectively. With coal consumption and production dropping in the USA, coal needed a great year in China and got it. Chinese coal consumption and production dwarfs that of every other nation. On top of enormous Chinese demand for coal, increases in India, Germany, United Kingdom, and other less likely nations in Europe served as icing on the cake for coal in 2012. Tim Puko had a good article over the weekend about gas industry jobs. Puko reports that official PA data for mining, drilling and logging jobs shows a drop of 4% in April compared to a year ago. The latest available data showed a total of 36,400 jobs in the official classifications within the extraction industries. The official mining, drilling and timbering data, however, does not include some jobs like title work that is featured in Puko's story that exist or don't exist, depending on whether the gas industry is expanding or contracting. While jobs directly or indirectly created by gas production will ebb and flow, a constant in good and bad times will be that the gas industry alone will never be able to bring prosperity to all of Pennsylvania. Governor Corbett's administration is crumbling faster than Pennsylvania'a roads and bridges that are the worse in the nation. Today brought the shocking news that the Governor fired Secretary Allan of the Department of Conservation and Natural Resources. Secretary Allan's departure brings the total of cabinet secretaries leaving Corbett's side to a big five. Speculation about the reasons for the firing are rampant, and some are suggesting Allan's departure is connected to the controversy about drilling in the Loyalsock State Forest. Really? 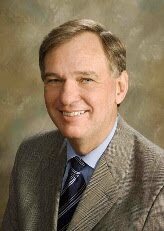 Secretary Allan has loyally followed the mistaken environmental, conservation, and drilling policies of Governor Corbett. If the Governor fired him over the Loyalsock State Forest case, the Governor fired Allan for following his orders. Political panic is sweeping through the Corbett Administration, as more and more Pennsylvanians realize that Governor Corbett just is not up to the tough job he has. And so perhaps Secretary Allan is being made to walk the plank for political reasons. But my gut tells me not so. The Governor owes the people of Pennsylvania an explanation right now about why he fired Secretary Allan. No matter what the Governor may say about the latest cabinet secretary departing, his administration is imploding, as a result of incompetence right at the top. The Allegheny Institute calculates royalties paid to Pennsylvanians with drilling leases at $731 million in 2012. That's a considerable sum but is 0.13% of all personal income in PA, a fact the paper notes too. The paper assumes that the royalty percentage is 12.5%, and that might be a tad low for the average payment. As such, the calculation of $731 million is not likely to be exaggerated. The infusion of royalty income is concentrated in a few counties like Susquehanna, Bradford, and Washington, where royalty income skyrocketed and became an important part of the local economies. While those local economies benefitted from this income boost, Pennsylvania's statewide job creation performance has not. Indeed, Pennsylvania has fallen from number 7 among the 50 states in job creation in 2010 to now the bottom 10 during the last year or so, even as total royalty income has surged. Over the last 15 months, Pennsylvania has created very few jobs and is not even getting its share of the 2 million jobs per year that the national economy is creating now like clockwork. A series of policy blunders by Governor Corbett in education, transportation, health care, and energy are more than enough to negate the positive impacts of national job creation and rising gas royalty income. Just imagine. What would the US economy look like if every person now spending $3.65 per gallon for gasoline paid $1.14 per gallon? That saving of $2.51 per gallon would increase disposable income for many families by $1,250 to $1,875 and cumulatively turbocharge consumption and investment throughout the US. And those savings are being already realized by those owners of the more than 100,000 electric vehicles already on US roads. The failure to move rapidly from oil to alternative transportation fuels remains a massive market and policy blunder. To make matters worse, Texas has chronically had too little generation to insure its families and business that their lights will stay on. Those of you in Texas that might be getting a little tired of having the lights go out are welcome in Pennsylvania! The North American Electricity Reliability Corporation (NERC) reports that PJM, of which Pennsylvania is part, has a 29% reserve margin this year, when the requirement is 15%. We know how to build power plants here and operate demand response programs too. Just saying. Total electricity production in the USA barely changed, climbing just 1%, the first two months of 2013, compared to the same period in 2012. But the stability in total power production conceals tremendous changes in the fortunes of the industries that generate electricity. Coal generation is up 8%, while gas generation is down 8%. That alone is big change. Though coal and natural gas remain the heavyweights of electricity generation locked in near mortal combat, solar power is now on the scoreboard. To be sure it is but a tadpole today. Yet, it is growing at a stupendous rate. Solar production is up 228% in 2013, compared to 2012. Amazing. If that growth rate continues, solar will be providing 1% of America's electricity generation within 2 years. In the electricity generation battles, solar is becoming a contender! Already a contender, wind power production is up so far a solid 10% in 2013 and continues to close on hydro power, the long-reigning, renewable energy electricity generation champion. In 2013, wind will produce about 60% of the power generated by hydro. As for nuclear, America's third leading source of electricity generation, 2013 has seen a 2.5% drop so far in power production. How electricity is generated in the USA is undergoing enormous change that is being driven by the comparative prices of coal and natural gas and the gathering renewable energy revolution. In Two States, 80% Of Drilling Companies File Frac Focus Reports On Time But 20% File Late: What's The Right Response? Many states have made reporting to Frac Focus part of their chemical disclosure requirements, and a new analysis finds that 20% of the required reports were late in Pennsylvania and Colorado. So what's the right response from regulators, when 80% of the industry complies with an important regulatory rule, but 20% fail to do so? Is it effectively to treat the same those companies who comply and those who do not? Regulators in Pennsylvania and Colorado imposed no penalties against those companies reporting late. By taking no action, regulators do send a message to those who did comply and those who did not. It is a message, however, that undermines excellence in operations and public confidence. A decade ago shale gas accounted for 2% of US gas supply, and now it is 40%. Amazing. With all that gas coming from shale drilled mostly on private lands, the gas industry could exercise self-restraint about drilling in sensitive places like the Loyalsock State Forest. While the USA has been dashing to natural gas and renewable energy since 2000, China has been consuming growing and huge amounts of coal. Chinese coal demand has been so strong that the world's consumption of coal has jumped from 5.3 billion tons in 2000 to 8.1 billion tons in 2011. Again nearly all of that growth is a result of exploding Chinese coal demand. See table below from linked to story. Measured anyway China's reliance on coal is astonishing. While the USA largely runs on oil and natural gas that together provide about 60% of our total energy, China is powered by coal. Coal alone provides approximately 70% of China's total energy but just 19% of US energy. 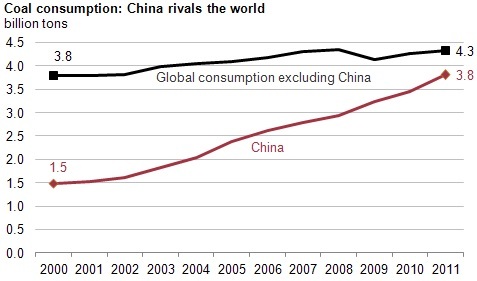 Indeed, Chinese coal consumption is an astonishing 47% of the entire world's consumption. By comparison, US coal consumption is approximately 11% of the world's 8.1 billion tons. On a per capita basis, Americans and Chinese use roughly equal amounts of coal, but China's coal usage continues to climb, while America's has been falling. Shale gas is a fundamental reason why coal consumption in the US has been falling but skyrocketing in China, more than doubling in 10 years. Shale gas has boomed in the USA but not to date in China. And I am skeptical that China's hunger for coal will diminish without natural gas to take its place. The Center for Climate and Energy Solutions gets two thumbs up for its report entitled "Leveraging Natural Gas To Reduce Greenhouse Gas Emissions. It is an objective analysis from start to finish. The report has a careful, accurate discussion of the methane leakage rate issue at page 3. The report notes that new EPA regulations will cut substantially methane leakage in the gas production phase, and 37% of all methane leakage in the lifecycle of gas takes place in the gas production phase. Continuing to cut methane leakage remains an important activity for regulators and companies. The report further points out that gas cuts carbon emissions, when it displaces coal, or oil but does not do so were it to displace nuclear or renewables. And gas has been displacing coal and oil in the USA from 2000 to 2012, while wind and solar have boomed and are now significant energy sources in the USA and around the world. The main purpose of the report is to recommend ways to maximize the carbon reducing opportunities presented by gas, while avoiding the displacement of renewables or nuclear by gas. In the USA, currently gas and renewables are growing at the expense of coal and oil, though the most recent few months have seen coal actually regain from gas some lost generation market share. To its credit, the report also states that natural gas alone is not a sufficient answer to our climate challenge. It can help, especially in the next 20 years, if used smartly but is far from a complete answer. Moreover, maximizing the benefits of gas requires adding carbon capture and storage to at least gas-fired power plants in the decades ahead. Hopefully, the passions over climate, fracking, and renewables won't crowd out reason and objective analysis. At any rate, this report is great factual analysis and devoid of polemics. I strongly recommend it. How does support for gas production in Pennsylvania decline to a plurality of 49% approving and 40% disapproving, as measured by the recent poll done by the University of Michigan and Muhlenberg College? In addition to no drilling tax and too many accidents and spills, driving down support is the belief that no place is off limits to gas drilling, not parks, not even the Loyalsock State Forest, a spectacular, wild place. The fate of the Loyalsock State Forest is becoming a test of whether there are limits on gas drilling that regulation or the gas industry itself voluntarily would impose. People from many walks of life and with divergent political opinions are all rallying to stop gas drilling in the Loyalsock. More than 250 Pennsylvanians took their time to attend a public hearing in Williamsport, Lycoming County, where gas drilling on private lands is also widely practiced and has considerable support. But not one of those attending testified at a public hearing in support of gas drilling in the Loyalsock. The contrast is stark between opinion about drilling in one of Pennsylvania's most special state forests and the desire of waiting private landowners who are eager for gas drilling to be done on their properties. The gas industry must respect public opinion, whether it likes that opinion or not, if it is to maintain the slim support it now has. Indeed, it cannot afford to win battles like the Loyalsock, if it wishes to avoid losing the public opinion war. US Ends Using Oil To Make Electricity: Is Transportation Next? Addictions of any sort are hard to break, and President George W. Bush famously described the US as addicted to oil. Well, it is time to give Uncle Sam real credit for breaking his oil addiction, at least for using oil to make electricity. As recently as 1973, the US used large amounts of oil to make electricity, but Uncle Sam has cut by 94% his consumption of oil to keep our national lights on. Consumption fell from 3,515 to 218 trillion BTU. How did Uncle Sam break his addiction to oil for making power? He found better substitutes. From 1973 to 1993, coal and nuclear power was largely responsible for replacing oil to make electricity. Starting around 1990, natural gas also began to reduce the use of oil to make electricity, and the substitution of gas for oil picked up pace with the shale gas revolution around 2006. In recent years, growing renewable energy generation has contributed as well. America's experience in getting off oil for making electricity shows the oil addiction can be beat. And what has already happened with the use of oil to make power has started in transportation. Oil consumption for transportation peaked in 2007 at 28,335 trillion BTU. By 2012, oil usage in transportation had fallen to 25,800 trillion BTU or a decline of nearly 10%. The decline is a function of better fuel efficiency in vehicles, a decline in miles traveled, and growing oil substitutes for transportation like natural gas, electricity, and biofuels. It took 40 years for America to break its oil addiction for making electricity, and it will take at least that long to do the same in transportation. But the data show the addiction to oil for moving around is already weakening. The war on oil continues. Oil substitutes--natural gas, electricity, and biofuels--are slowly displacing more and more expensive, dirty oil and are a major reason why US oil consumption is back to 1999 to 2000 levels. While biodiesel is a small competitor to oil, the biodiesel David is growing, as it battles the oil Goliath that remains our top energy source. Biodiesel production jumped 43% in March, compared to February. Even more impressively, March 2013 production set an all-time record for biodiesel produced in the month of March. Moreover, March 2013 production of 98 million gallons was the fifth highest amount produced in any single month. Biodiesel is a wonderful energy product, normally made from soy beans or restaurant grease. It has a vastly superior energy balance to either gasoline or corn ethanol, making it one of the cleanest transportation fuels available. The all-time monthly record still stands at 109 million gallons in December 2011. Last year the monthly high was 100 million gallons in May. Chances of a new monthly record being set in 2013 are looking up.